How do I create a readable diff of two spreadsheets using git diff? We have a lot of spreadsheets (xls) in our source code repository. These are usually edited with gnumeric or openoffice.org, and are mostly used to populate databases for unit testing with dbUnit. There are no easy ways of doing diffs on xls files that I know of, and this makes merging extremely tedious and error prone. I've tried to converting the spreadsheets to xml and doing a regular diff, but it really feels like it should be a last resort. I'd like to perform the diffing (and merging) with git as I do with text files. How would I do this, e.g. when issuing git diff? We faced the exact same issue in our co. Our tests output excel workbooks. Binary diff was not an option. So we rolled out our own simple command line tool. Check out the ExcelCompare project. Infact this allows us to automate our tests quite nicely. Patches / Feature requests quite welcome! Ctrl+C (copy), Ctrl+A (select all), Ctrl+V (paste) to fill the sheet. If the sheets are similar, this spreadsheet will be empty except for a few cells with X in them, highlighting the differences. Unzoom to 40% to quickly see what is different. A) Write a simple dump program that steps through all worksheets and saves all data to tab-separated files. Create one file per worksheet (use the worksheet name as the filename, e.g. "MyWorksheet.tsv"), and create a new folder for these files each time you run the program. Name the folder after the excel filename and add a timestamp, e.g. "20080922-065412-MyExcelFile". I did this in Java using a library called JExcelAPI. It's really quite easy. B) Add a Windows shell extension to run your new Java program from step A when right-clicking on an Excel file. This makes it very easy to run this program. You need to Google how to do this, but it's as easy as writing a *.reg file. C) Get BeyondCompare. It has a very cool feature to compare delimited data by showing it in a nice table, see screenshot. D) You're now ready to compare Excel files with ease. Right-click on Excel file 1 and run your dump program. It will create a folder with one file per worksheet. Right-click on Excel file 2 and run your dump program. It will create a second folder with one file per worksheet. Now use BeyondCompare (BC) to compare the folders. Each file represents a worksheet, so if there are differences in a worksheet BC will show this and you can drill down and do a file comparison. BC will show the comparison in a nice table layout, and you can hide rows and columns you're not interested in. It gives a good visual output online, in terms of rows added,deleted, changed etc. Plus you donot have to install anything. Hmmm. From the Excel menu choose Window -> Compare side by side? Do you use TortoiseSVN for doing your commits and updates in subversion? It has a diff tool, however comparing Excel files is still not really user friendly. In my environment (Win XP, Office 2007), it opens up two excel files for side by side comparison. Right click document > Tortoise SVN > Show Log > select revision > right click for "Compare with working copy". I know several responses have suggested exporting the file to csv or some other text format, and then comparing them. I haven't seen it mentioned specifically, but Beyond Compare 3 has a number of additional file formats that it supports. See Additional File Formats. Using one of the Microsoft Excel File Formats you can easily compare two Excel files without going through the export to another format option. Use diffdog's XML diff mode and Grid View to review the differences in an easy to read tabular format. Text diff'ing is MUCH HARDER for spreadsheets of any complexity. With this tool, at least two methods are viable under various circumstances. To detect the differences of a simple, one sheet spreadsheet, save the Excel spreadsheets to compare as XML Spreadsheet 2003 with a .xml extension. To detect the differences of most spreadsheets in a modularized document model, save the Excel spreadsheets to compare as an Excel Workbook in .xlsx form. Open the files to diff with diffdog. It informs you that the file is a ZIP archive, and asks if you want to open it for directory comparison. Upon agreeing to directory comparison, it becomes a relatively simple matter of double-clicking logical parts of the document to diff them (with the XML diff mode). Most parts of the .xslx document are XML-formatted data. The Grid View is extremely useful. It is trivial to diff individual sheets to focus the analysis on areas that are known to have changed. Excel's propensity to tweak certain attribute names with every save is annoying, but diffdog's XML diff'ing capabilities include the ability to filter certain kinds of differences. For example, Excel spreadsheets in XML form contain row and c elements that have s attributes (style) that rename with every save. Setting up a filter like c:s makes it much easier to view only content changes. diffdog has a lot of diff'ing capability. I've listed the XML diff modes only simply because I haven't used another tool that I liked better when it comes to differencing Excel documents. Newer versions of MS Office come with Spreadsheet Compare, which performs a fairly nice diff in a GUI. It detects most kinds of changes. There is a library daff (short for data diff) which helps in comparing tables, producing a summary of their diffs, and using such a summary as a patch file. It is written in Haxe, so it can be compiled in major languages. I found an openoffice macro here that will invoke openoffice's compare documents function on two files. Unfortunately, openoffice's spreadsheet compare seems a little flaky; I just had the 'Reject All' button insert a superfluous column in my document. If you're using Java, you could try simple-excel. It'll diff spreadsheets using Hamcrest matchers and output something like this. I should qualify that we wrote that tool (like the ticked answer rolled their own). If you have TortoiseSVN then you can CTRL click the two files to select them in Windows Explorer and then right-click, TortoiseSVN->Diff. This works particularly well if you are looking for a small change in a large data set. With formula cell. It will compare both formula and value. Diff Doc may be what you're looking for. Choose any portion of any document (file) and compare it against any portion of the same or different document (file). You could write some VBA code that steps through each Worksheet, Row, Column and Cell of the two Workbooks, reporting differences. If you use Excel 2007, you could save the Workbooks as Open-XML (*.xlsx) format, extract the XML and diff that. The Open-XML file is essentially just a .zip file of .xml files and manifests. You'll end up with a lot of "noise" in either case if your spreadsheets aren't structurally "close" to begin with. Convert to cvs then upload to a version control system then diff with an advanced version control diff tool. When I used perforce it had a great diff tool, but I forget the name of it. It makes Git work with any Excel workbook file format without any workarounds. Not the answer you're looking for? 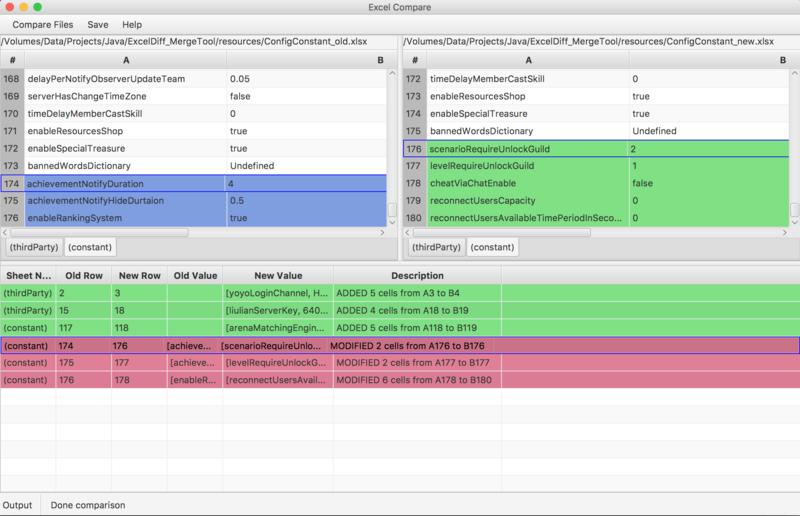 Browse other questions tagged git version-control merge diff xls or ask your own question. How to script Excel 2013's Spreadsheet Compare?